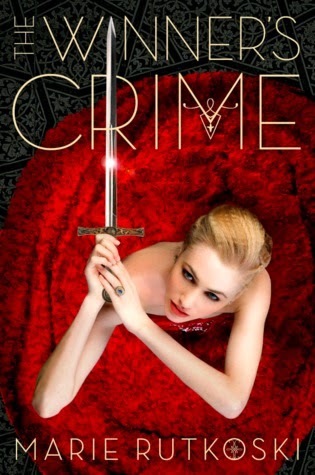 The Winner's Crime by Marie Rutkoski is the sequel to The Winner's Curse which I read last year and loved! There's something incredibly emotional and heart-breaking in the relationship between Arin and Kestrel and I am absolutely desperate to know more and I live in hope that these two star-crossed lovers can find a way to bridge their differences. The Winner's Crime is the second book in the Winner's trilogy and this review will spoil some of the events of the first book in the trilogy, The Winner's Curse, though will not spoil anything in The Winner's Crime. If you have an interest in reading this trilogy but have not yet started it, I would suggest you stop reading now. The Winner's Crime follows on pretty quickly after the events of The Winner's Curse. Kestrel has struck a bargain and traded her life for one of balls and celebrations as she is now engaged to the Crown Prince of Valoria and feels very isolated and restricted in things she can say and do. She combats giving away military advice that destroys the East with spying for Herran and Kestrel really walks a dangerous line in this book. There's also Arin, who is now the governor of Herran and he's under so much pressure to keep his country's freedom and has no idea of the sacrifices Kestrel has made in his honour. Instead he feel bitter and angry about the games he feel that Kestrel is playing. What I love so much about this trilogy so far is that it has been very surprising in how vicious it is. There are so many twists and turns in the story line. Nobody is safe, anybody could die and most do. I love that Kestrel and Arin are both characters who are good people who do bad things for supposedly the right reasons. I love that that line is crossed on so many different instances. I also love that there are so many complicated relationships. Parents and siblings, friendships, and, of course, this undeniably scorching hot relationship between Kestrel and Arin. Theirs is a relationship that has so many obstacles for them to overcome. I love Kestrel and Arin incredibly but I also loved the new characters that are introduced in this book and how the story has expanded to included the East and new allies and weaponry and world-building. This book is a real page-turner. It's exciting and addictive and I thought it had a real subtle build-up of angst and heart-break. I finished this book absolutely desperate for the next installment of this story! Great review! I really need to read this series. YES YOU DO! What an amazing series! Ha, we must be on the same wave length, my review for this went up today too! Great review! I know what you mean about it being very vicious, especailly in comparison to a lot of YA books. I really felt like no one was safe and was terrified everything was about to fall apart throughout! It was such a great book though. The tension! Oh, the tension. My poor heart almost couldn't take it!